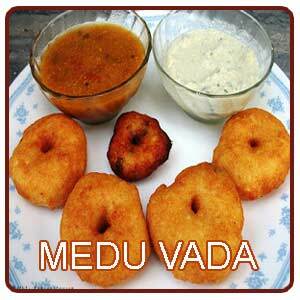 -Medu Vada or the Indian doughnut is one of the most traditional foods of South India rated high for its ancient past. Medu vada is a favorite South Indian food which is very commonly prepared at home and it is an indispensable part of everyday cuisine. Vada is an absolutely necessary part of the menu in South India on festivals, puja days and on occasions. Vada is prepared by deep frying the dough in the oil and then it is served along with palatable accompaniments. Vada is mostly disc shaped which can take varying size and shape and is usually 5 to 8 cm across. The primary ingredients which are used in the preparation of Vada are dal, lentil and gram flour. -Vada is a very common food item which is a common sight in the streets of the Indian subcontinent and Sri Lanka. Medu vada is mostly accompanied with breakfast. A vada depending upon the size roughly contributes about 300 kcal. It is a quick all-day snack which is not missed out in any snack or tea stall. Medu vada is not only a traditional food of India but it is also relished by people living in other foreign countries along with chutney and sambhar. In addition to the black de-husked lentils sliced green chilies, curry leaves and onions are mixed to the batter. This wheel or disc shaped vada has a hole in the middle. Ulundu or the medu vada is mostly bland and is has to be eaten along with chutney or sambhar for better taste. 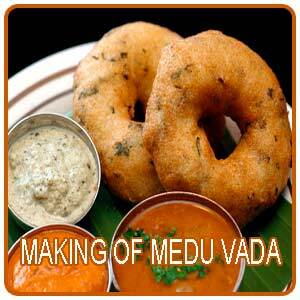 -The name medu vada itself means soft vada and the softness of the vada depends upon the consistency of the batter. So care should be taken while grinding the batter for the vada with just enough water to make soft but not watery dough. Once the batter is ground and left for a long time the fermentation will lead to too much of absorption of oil while cooking or deep frying. One of the most defining feature of the medu vada is the hole in the centre. This is one easiest snack to be made at home and is liked by kids and also by old people. -Medu vadas takes different avatars with small additions and alterations to it. Some of the other specialties which comes out of the medu vada are Dahi vadas, Sambar vadas, etc . There are many varieties of vadas made from urad dal batter as the basis but for festivals and poojas this is the only type of vada prepared for prasad (Neivediyam). But when it is prepared for the purpose of neivediyam no onions are added to the mixture. This is a delicacy of the South Indian kitchen. Black gram which is the main ingredient of medu vada takes the pride of being originated in India and later spread to other tropical areas by the people who migrated from India. -Black gram is cultivated from ancient times and is one of the most highly prized pulses of India. This kitchen culinary which is prepared mainly using the lentils is highly nutritious and is recommended for diabetics. The medu vadas are really delicious when the outer casings are crispy crackling and soft spongy inside with hardly any traces of oil smell or greasy taste. When medu vada is eaten along with sambar and coconut chutney it tastes simply divine and even people compare it to a dish whose combination namely the vada with the sambhar and chutney is decided in the heaven. -Clean, wash and soak the urad dal in enough water for at least 2 to 5 hours. - Once it is soaked drain the water and then add green chilies, pepper, curry leaves, asafetida and ginger and blend to make a smooth batter with adding very little water and bend it well so that the batter gets consistency of fluffy. - Now heat enough oil in a kadai to deep fry the vadas. - Take little batter in hand and make a small hole and put into oil. - This way start frying them one by one. - Deep fry vadas untill crisp and light golden brown texture. - Once fried drain the vada in absorbent paper. - Serve hot with fried coconut chutney and sambhar. Vadas are usually enjoyed when it is hot.